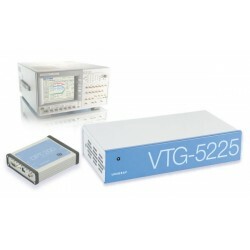 Unigraf is an innovative Finland based company specializing in Test & Measurement, Video signal capturing and Industrial monitoring applications. 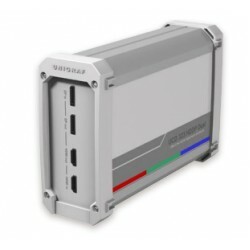 Its technological strengths are the deep understanding of various kinds of display interfaces, the PC architecture and the requirements of environmental ruggedness. 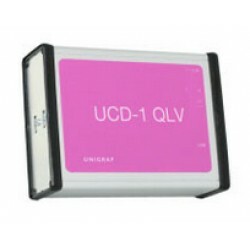 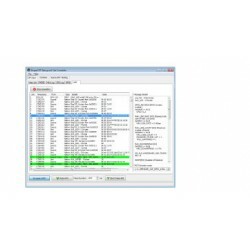 Unigraf DP RefSink CTS Tool software for DP 1.2 Link Layer Extensions co..
Unigraf DP LL CTS Ext1 and Core Set A+B+C MC5912 Sets A+B+C containing l..
Unigraf DP Ref Sink Extended HDCP CTS Upgrade 065039 The tool can be use..
Unigraf DP Ref Sink HDCP CTS Tool 065035 can be used witheither the D..
Unigraf DP RefSink Audio CTS 065043 Tool software for Audio compliance t..
DP RefSink AUX Controller is a software that makes Unigraf DP Reference ..
Unigraf DP RefSink CTS LL 065033 The CTS test GUI is organized in functi..
Unigraf DP RefSink CTS LL Extensions, Upgrade Set A to Sets A+B (for DPR..
Unigraf DP RefSink Link layer and HDCP CTS Tool 065037 consist of two co..
Unigraf DP RefSink Link layer HDCP Extended HDCP CTS Tool 065038 consist..
Unigraf DP RefSink LL CTS Upgrade from A+B to A+B+C (for DPR-120) ..
Unigraf DP RefSink Reduced Lane Count Test Set D MF5912 Reduced Lane Count ..
DP RefSource AUX Controller is a software that makes Unigraf DisplayPort..
Unigraf CTS Test Software Product Options for Reference Sources: - ..
Unigraf DP RefSource CTS LL & HDCP & EXT HDCP 065045 software fo..
DPA-400 1.2 is a compact, pocket sized device that provides a full Displ..
Unigraf DPA-400 1.4 AUX Channel Monitor is a compact, pocket sized devic..
Unigraf DPA-400 USB-C DisplayPort Cable 546109 you can attach DPA-400 direc..
Unigraf DPR-120 DP 1.2 Compliant Reference Sink 065912 is a compact, yet.. 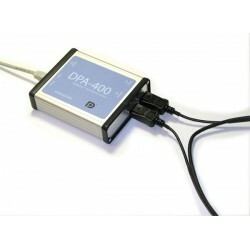 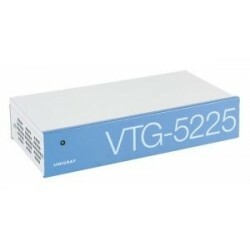 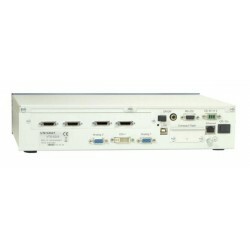 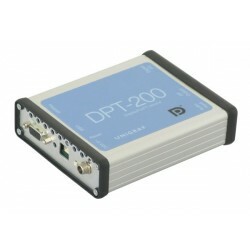 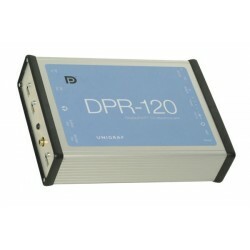 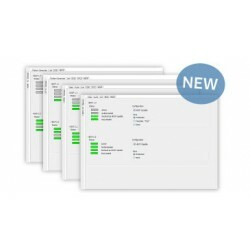 The AUX Channel Monitor and MST Stream Timeslot Allocation panel are an add..
Unigraf DPR-120 Test Automation Shell SW MA5912 (TA Shell) is an optiona..
Versatile Tool for DP Sink Testing The DPT-200 is a full featured and ..
Unigraf DSC Decoder MT6642 Display Stream Compression..
Unigraf HDCP 2.2 CTS for testing Sink DUT on DP MT6636 HDCP 2.2 on DisplayP..
Unigraf HDCP 2.2 CTS for Testing Source DUT on DP MT6634 HDCP 2.2 on Displa..
Unigraf HDCP 2.2 Support MT6504 provides HDCP 2.2 control and monitoring ca..
Unigraf LTTPR Link-Training Tunable PHY Repeater MT6644 is for UCD-400 at t..
Unigraf MF5912 DP RefSink Reduced Lane Count Test Set D, Reduced Lane Count..
Unigraf MT6635 DP 1.4 LL CTS for testing Sink DUT. 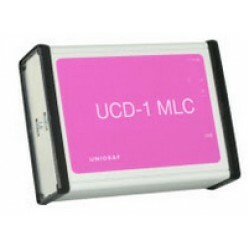 DP 1.4 LL compliance tes..
Unigraf MT6637 DP 1.4 LL CTS for testing Source. 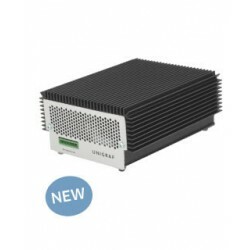 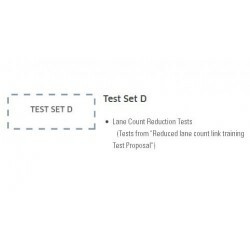 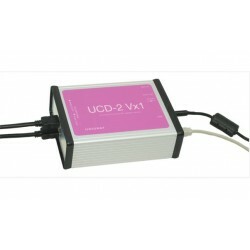 DP 1.4 LL compliance..
Unigraf MT6638 HDCP 2.2 CTS for testing Sink, Source and Repeater DUT. 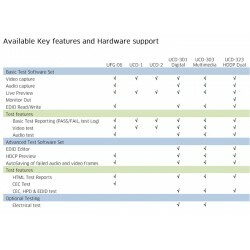 HDCP..
Unigraf MT6639 DP 1.4 LL CTS for testing Sink Source and Branch DUT, DP 1.4..
Unigraf TSI SDK Advanced Test Set with HDCP 2.2 Support MT6516 Advanced fea..
Unigraf UCD Console Pro for DP Alt Mode Reference Sink and Reference Source..
Unigraf UCD Console Pro for DP Reference Sink MT6611 advanced features for ..
Unigraf UCD Console Pro for DP Reference Source MT6614 advanced features fo..
Unigraf UCD Console Pro for HDMI Reference Sink MT6610 advanced features fo..
Unigraf UCD Console Pro for HDMI Reference Source MT6613 advanced features ..
UCD-1 MLC is a frame grabber that can capture four (4) 6-lane mini-LVDS ..
Unigraf UCD-1 QLV is a frame grabber that can capture four (4) parallel ..
Unigraf UCD-2 Vx1 V-by-One Frame Grabber UCD series is a family of compa..
Unigraf UCD-240 Dual USB Type-C DP Alt Mode Tester 066426 2-Input or Output..
Unigraf UCD-240 066415 Automated USB-C Test Tool features an efficient and ..
Unigraf UCD-301 Digital enables testing all aspects of HDMI 2.0 an..
Unigraf UCD-323 HDDP 4GB Frame Buffer 4K 066518 Dual Test Module With 4K in..
Unigraf UCD-323 HDDP Dual enables testing of HDMI 2.0 and DP 1.2 sinks, ..
Unigraf UCD-340 USB-C DP Alt Mode Tester 066514 is the first integrated tes..
Unigraf UCD-340 USB-C DP Alt Mode Tester with Electrical Test 066515 4K cap..
Unigraf UCD-400 Development Kit 066600 test unit for verifying DisplayPort ..
Unigraf DisplayPort Reference Sink realized with UFG-04 DP 062745 board ..
UFG-04 LVDS is an optimal tool for testing the fidelity of input and sca.. 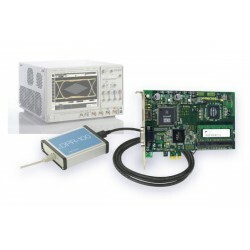 Testing TV and Monitor Electronics UFG-04 LVDS is an optimal tool for ..
UFG-05 32 is a versatile frame grabber that enables capture of high defi.. 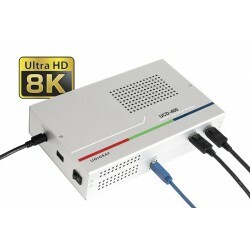 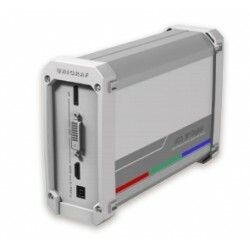 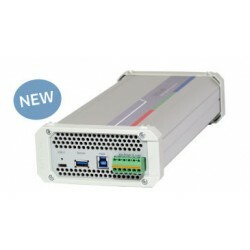 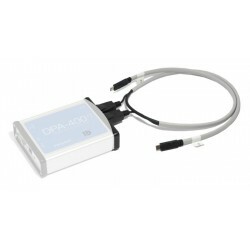 The practically limitless speed of UFG-06 Nopea HDMI and DP frame grabbe..
Unigraf UFG-07 HS Dual Multifunction High Speed Capture Card is a modern..
Unigraf UFG-07 HS Multifunction High Speed Capture Card Series is a mode..
Unigraf UFG-07 STD Capture Card provide all three common video interface..
Unigraf UFG-12 2S Two SDI inputs Frame Grabber 062895 low profile frame gra..
Unigraf UFG-12 4H Series 062896 is a modern PCIe bus based frame grabber fa..
Unigraf UFG-12 HDMI 4K Frame Grabber 062892 features one HDMI 2.0 input sup..
Unigraf UFG-12 M Frame Grabber 062893 features five popular video input typ..
Unigraf UFG-12 MC Frame Grabber 062894 features on-board hardware compressi..
Unigraf USB-C External Power Test Unit 066522 for testing Power load for Si..
Unigraf UTS TSI Advance Test SW Set MT6501 introduces a high level Test Sof..
Unigraf UTS TSI Optional Electrical Testing MT6502 introduces a high lev..
Unigraf VTG-5225 DP video pattern generator is an optimum solution for t..
Unigraf VTG-5225 QLT Quad LVDS Pattern Generator supports the demandin..
UFG-04 HDMA is the hardware platform for a complete test suit for testin..